The HYPERGRID INTERNATIONAL EXPO is a multi-language event in Opensim, aimed at promoting cross cultural connections across the Hypergrid. ​It is a not-for-profit event, organized by volunteers. 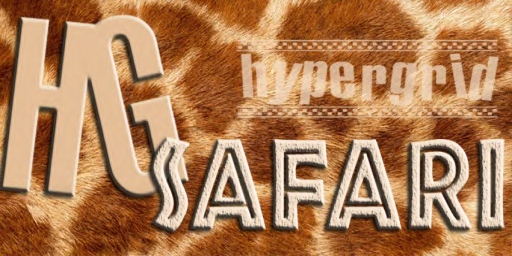 ​The Hypergrid International Expo is an event held in the virtual world platform known as Opensim. For more about Opensim, see the Opensimulator website. Opensim is similar to Second Life, but instead of being one big commercial grid, it is made up of hundreds of independently owned and operated worlds, connected via Hypergridding. Just as you can surf from one website to another using the same browser, so you can Hypergrid, or grid jump, from one world to another using the same avatar, as long as the avatar was created on a Hypergrid-friendly world. Many of Opensim's finest creators and innovators are not native English speakers, and shy away from speaking in public at English Language events, inworld. 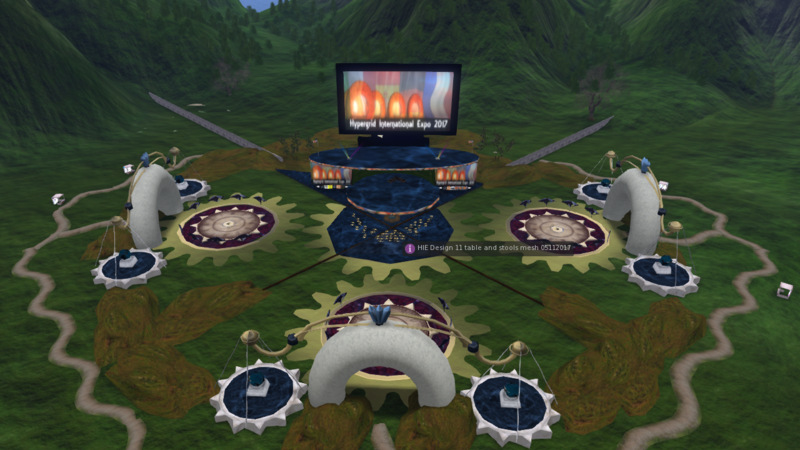 The Hypergrid International Expo gives these people the opportunity to tell the community about their history, present projects, and plans for the future on a number of different subjects, from technical to artistic to educational to social projects. In this first edition, the four languages used were Spanish, German, French, and Italian, but in future editions we hope to involve other language groups like Portuguese and Japanese. The event is for people whose first language is not English. It's a chance for German, Spanish, Italian. Portuguese and French native speakers to tell their story in their own language, with a translation supplied via Groups so that all can follow the talks. 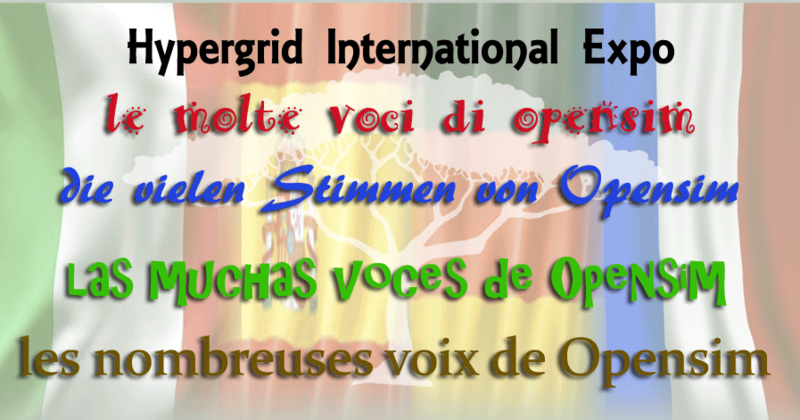 The Hypergrid International Expo is associated with the Opensim Community Conference. of the 2017 HIE event on Mal Burns Channel ​on Youtube​. 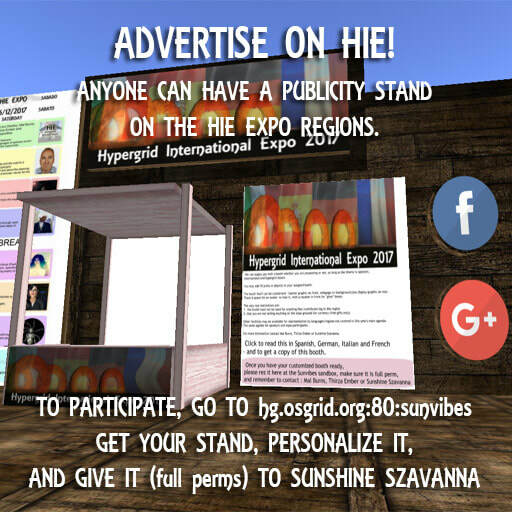 The Hypergrid International Expo publicity booths are set out around the perimeter of the Auditorium regions. Booths provide further information about regions and grids all over the hyperverse. Each booth comes with one Media on a Prim panel, and can be customized with your own pictures and logos. You can also add up to ten prims with landmarks, freebies, and more to let the world know about your virtual life!